If you are a long time reader of Kitchen Concoctions then you know for breakfast I am usually an oatmeal girl. But with my summer being so busy (calling for many early mornings), I needed breakfast options I could eat on the run. Muffins and some fruit have been my go to (cuz this girl HAS to eat breakfast) on these early mornings. I love that I can whip up a batch of muffins on a less busy day, keep them on the kitchen counter for a few days and then wrap them up individually to freeze for later. Most muffins, including the muffins below, freeze beautifully! The great thing is you can take them out of the freezer the night before or the morning of and have a quick breakfast or snack in the afternoon (see notes in the recipe). 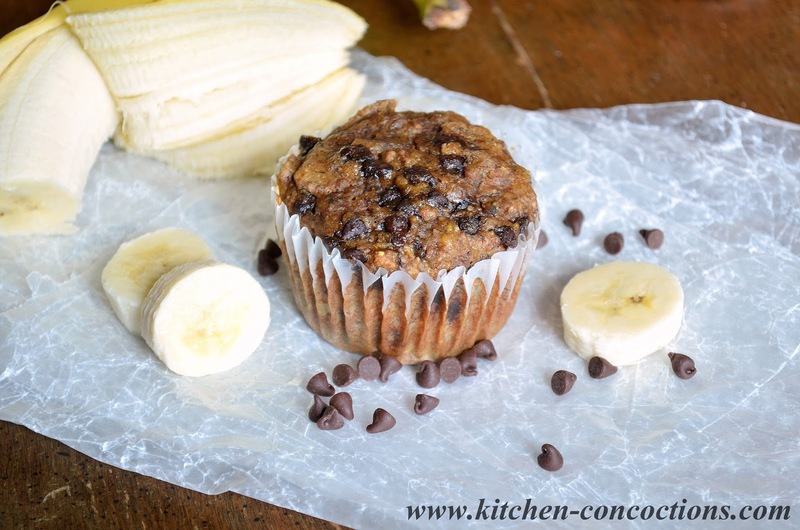 These Banana Bran Muffins are hearty, dense and filling. 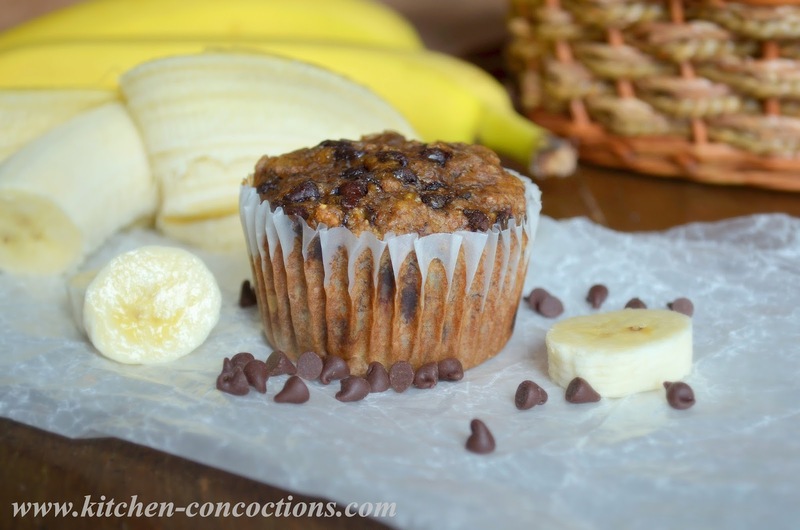 Even though these muffins are packed with whole wheat flour and bran flakes, they are perfectly sweet and with the little pops of chocolate chips, makes you feel like you really are having a special treat! Preheat oven to 350 degrees F. Grease muffin tins or line with muffin cups. In a large mixing bowl, cream together the butter and sugar. Add the eggs, one at a time, mixing well after each addition. Add applesauce, bananas, buttermilk and vanilla; mix well. In a medium sized bowl combine the flours, baking soda, cinnamon and salt. 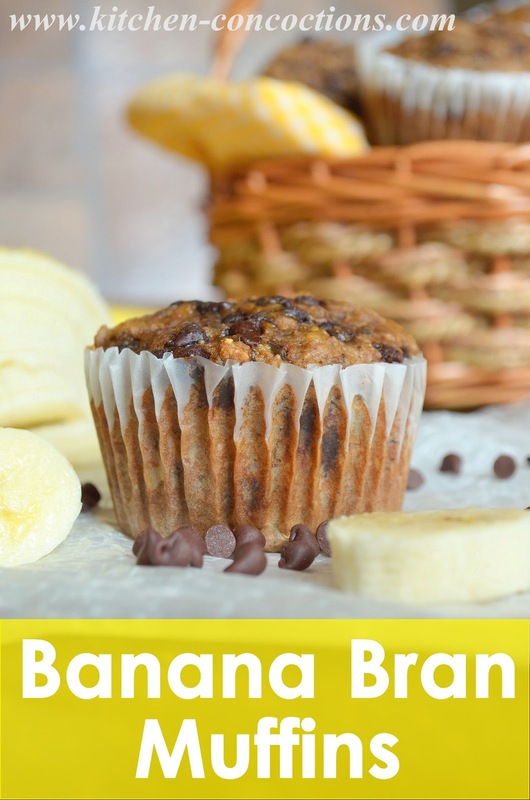 Gradually mix the flour mixture into the banana mixture; mixing until evenly combined. Stir in bran flakes and chocolate chips. Mix just until evenly moistened, the batter will be lumpy. Fill greased or paper-lined muffin cups two-thirds full. Bake for 16-18 minutes until a toothpick comes out clean. Remove to a wire rack to cool completely. Store the muffins in an airtight container for 1-3 days or freeze in a freezer bag, wrapped in foil or in an airtight container for up to a month. To thaw, place on counter and allow to thaw for 3-4 hours before serving. Or remove from freezer packaging and place frozen muffins in a 350 degree oven until heated through. Frozen muffins can also be defrosted in microwave for 5-8 minutes on half power until thawed and heated through. *Note: I have made these using Buckwheat and Hemp cereal with great success.